Dental implants are artificial tooth roots that are placed in the jaw, this artificial root will hold the replacement tooth or bridge. Dental Implants are an option for patients that have missing teeth or tooth due to periodontal disease, injury or other reasons. Dental implants are a popular and effective way to replace missing teeth and are good long term options for restoring your smile. There are two common types of dental implants that are placed in the jaw. There is Endosteal (in the bone) and Subperiosteal (on the bone). Endosteal is the most common used implants, they come in various forms like screws, or cylinders. Each implant holds a prosthetic tooth or teeth. Subperiosteal are placed on top of the jaw usually in metal framework post coming out through the gums to hold the prosthesis. This type of implant is placed on patients that are unable to wear conventional dentures due to minimal bone height. The dental implant procedure is done in several appointments. It begins with your dentist surgically placing the dental implant into the jawbone. It takes a few months for the bone to accept the implant.This step is called Osseointegration which means combines with bone. Next a healing abutment is placed and the patient waits a few weeks after the healing abutment for the next step. The next step is placing the artificial tooth or teeth, this tooth will be based on the size, shape, and color of your other teeth. The replacement tooth is deisgned to blend in with your other teeth. This procedure takes a couple of months, meanwhile your dentist will give you a temporary crown , bridge or denture to replace the missing tooth/ teeth. The advantages of dental implants are they improve your appearance, the implant replacement tooth feel and look like your own teeth. 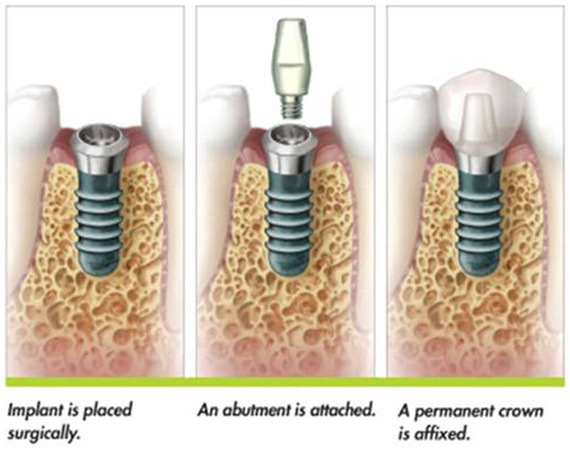 Dental Implants are very durable, they can last many years with good care they can last a lifetime. They are also very comfortable, they become part of you and feel like your natural teeth. This entry was posted in dentist, santa ana, smiles on bristol and tagged Dental Implant, santa ana, smiles on bristol. santa ana on September 13, 2016 by Francisco Torres. Dental Bridges are fixed prosthodontics that are cemented on to an existing tooth or implant. Unlike removable prosthodontics the dental bridge can only be removed by a dentist after being cemented. A Dental Bridge is recommended when one or more teeth are missing. It is highly recommended to replace a missing tooth, if a missing tooth is not replace the neighboring teeth begin to shift to the empty space. This causes more trouble in your mouth, like periodontitis or crowded or misaligned teeth. 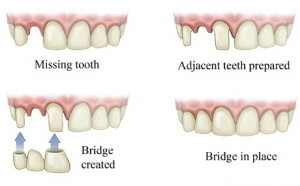 Traditional Dental Bridges are the most common type of bridge. They require two teeth and they must have a gap in the middle to be able to place a fake tooth or anchor tooth. Traditional dental bridges can restore the ability to chew properly, restore your smiles, and prevent your teeth from shifting to different positions. It also helps with distributing the bite evenly in your mouth. Our Santa Ana dentist Dr. Danial Kalantari always gives his patients options for replacing a missing tooth. The dental bridge procedure is usually done in two visits. The first visit a preliminary impression is taken for your temporary bridge. After the preliminary impression is taken the dentist begins to file down your teeth to create room for your permanent bridge. Once the filing is complete the dentist will take an impression to send to the lab to fabricate your permanent bridge. After the impression is taken and completed the dentist or registered dental assistant will fabricate your temporary bridge. This will protect your teeth that have been filed down and your gum, meanwhile your permanent bridge is being fabricated. The following appointment will be the delivery of the bridge. The temporary bridge and removed and your permanent bridge will be delivered. 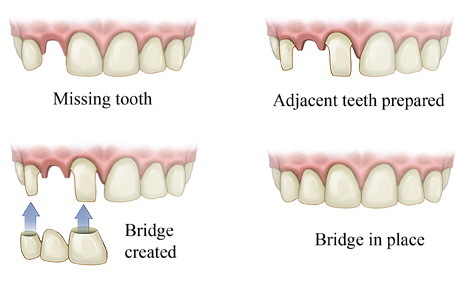 There are a few adjustments to be made when they deliver your permanent bridge. There can be a chance that you return one time between the impression date and delivery date for a bridge try in. On the try in date your dentist will check that all margins are correct before they finalize the bridge; some adjustments can be made in this appointment. This entry was posted in Uncategorized and tagged dental bridge, smiles on bristol. santa ana on March 17, 2016 by Francisco Torres.